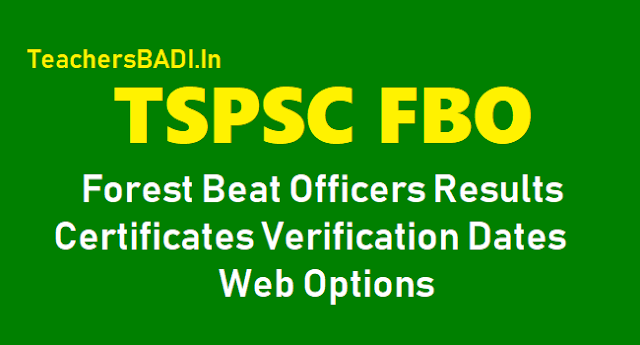 The Telangana State Public Service Commission (TSPSC) has on Tuesday announced the result for the examination conducted to select the Forest Beat Officers (FBO). The TSPSC has released the Forest Beat Officers results on its official website - https://tspsc.gov.in/. The result of the 23 candidates is withheld as the selection of these vacancies are dependent on clarification on claim of Agency. The TSPSC has selected 2,476 candidates, a record for the number of selections on a single day. Since its inception, the Commission has now filled up around 20,000 vacancies in the state. Now the candidate is required to produce original certificates as in accordance with the rules/notification. There are around 1,856 vacancies for Forest Beat Officers (FBO), 699 vacancies of School Assistants – Social Studies (Telugu medium) through the Teacher Recruitment Test and 52 vacancies of Trained Graduate Teachers (TGT)-Science in various Residential Educational Institutions Societies. The written examination was conducted in two shifts - forenoon and afternoon on October 29, 2017. The Physical Test was held in two spells i.e., from July 2, 2018 to July 12, 2018 and on February 6, 2019. The Certificate Verification held for the Post of Forest Beat Officer in Forest Department from August 20, 2018 to August 25, 2018 in erstwhile districts and on February 5, 2019 at TSPSC Office, Hyderabad. Candidates should note that success in the examination confers no right to appointment unless the appointing authority is satisfied after such enquiry as the case may be considered necessary, that the candidate having regard to her/his character and antecedents is suitable in all respects for appointment to the service. If the candidate is not found physically fit for the post, his/her candidature may be cancelled by the Commission. TSPSC Office, Hyderabad, to the post of FOREST BEAT OFFICER IN FOREST Department, the following Hall ticket numbers have been provisionally selected for appointment to the post of FOREST BEAT OFFICER IN FOREST DEPARTMENT vide Commission’s Notification No.48/2017, Dated: 15/08/2017. The selections are published here with subject to the following conditions. TSPSC has informed that, In continuation of the result notification dated :20/06/2018, on the basis of written examination held on 29/10/2017 FN & AN to the post of Forest Beat Officers in T S Forest Department, the list of Hall ticket Numbers of the candidates in second spell who provisionally admitted to Certificate Verification scheduled to be held on 05/02/2019 at 10.00 AM onwards in the TSPSC Office, M J Road, Nampally, Hyderabad are hosted on the Commission’s website www.tspsc.gov.in. The Physical Test and Events will be conducted on 06/02/2019 at 6.00 AM at Nehru Zoological Park, Bahadurpura, Hyderabad. The candidates should download the Memo and other required documents for verification and exercise their Web Options through the link provided on the Commission’s Website on 04/02/2019 & 05/02/2019 without fail. PRATHIBHA BHAVAN O/O TSPSC NAMPALLY HYDERABAD and Physical Test and Events will be conducted on 06/02/2019 from 6.00 AM at Nehru Zoological Park, Bahadurpura, Hyderabad. The following original documents along with one set of Photo copies attested by a Gazetted Officer along with one set of Basic information data (Check list) and two sets of Attestation forms for verification of Certificates without fail. Request for extension of time for producing certificates will not be entertained. 1. Checklist (Basic information data to be filled by the candidate &download from The Commission’s website, 1 set). 2. Hall Ticket of the written examination. 10. Certificate of EYE VISION Proforma (to be certified by the Govt. Ophthalmologist not below the rank of Civil Asst Surgeon). Certificate issued by the Private Doctors/Hospitals will not be considered. 11. Proof of age relaxation in case of Telangana State Government Servant (Regular Service certificates from the concerned department, Government of Telangana State / NCC instructor certificate/ Retrenched Census service certificate, Exservicemen Certificate if any. 12. Confirmation that web options were exercised. 14. Sets of Attestation forms duly signed by Gazetted Officer. He/ She is further informed that, failure to comply with the above directions may lead to cancellation of her candidature. 1. In continuation of the result notification dated:20/06/2018, it is hereby notified that on the basis of written examination held on 29/10/2017 FN & AN to the post of Forest Beat Officers in T S Forest Department, the candidates with the following hall ticket numbers have been provisionally admitted to Medical, Physical Test and Events. 3. The candidate who are admitted for the verification of Certificates are required to produce the Original Certificates along with one set of Photostat copies duly attested by Gazetted Officer, relating to Age, Qualifications Community (Integrated) , Latest Creamy Layer exemption certificate in case of B.Cs as per Memo No.3009/BCW/OP/2009, Government of Telangana, Backward Classes Welfare (OP) Department, Dt:18/12/2015 (prescribed format hosted on Commission’s website), Certificates relating to claim of age relaxation, Study (from 4th class to 10th class), Agency area certificates (For ST candidates only) basic information data (Check List(1set), attestation forms (2 sets) and if any, at the time of verification of documents, failing which, they will not be admitted in subsequent process of selection. No request will be entertained for subsequent submission of any of the above certificates. In terms of the notification, the candidates should possess the requisite qualifications as on date of notification i.e. 15-08-2017. 4. As per the Notification, “The post of F.B.O 100% reserved in Scheduled/Agency areas for local ST’s only”. In this regard the ST Candidates in Agency areas should produce local area certificate issued by the concerned Tahsildar/Mandal Revenue Officer is criteria for local candidature. 5. The dates for verification of certificates will be held on 05/02/2019 from 10.00 AM onwards at TSPSC Office, Prathibha Bhavan, M J Road, Nampally, Hyderabad. Meanwhile the candidates are requested to obtain and keep ready all the certificates as mentioned in the Notification. TSPSC FBO Forest Beat Officers Results, Certificates verification dates 2018: On the basis of written examination held on 29/10/2017 FN & AN for the post of Forest Beat Officer in Forest Department vide Notification No.48/2017, the provisionally admitted candidates who are qualified in Physical test and events will be called for Certificates Verification with required certificates/documents tentatively during the third week of August. The date and schedule will be announced later. The candidates are instructed to be ready with their required documents at the time of verification. Please visit the Commission’s website (www.tspsc.gov.in) for further details. How to check TSPSC Forest Beat Officer 2017 Result? Step 4 : Download the pdf and save it. 1. It is hereby notified that on the basis of written examination held on 29-10-2017 FN & AN to the post of Forest Beat Officer in Forest Department, the candidates with the following hall ticket numbers have been provisionally admitted to Medical, Physical Test and Events in the ratio of 1:3. The candidates who successfully qualify in the Physical Test and events will be called for verification of certificates. 3. The candidate who are admitted for the verification of Certificates are required to produce the Original Certificates along with one set of Photostat copies duly attested by Gazetted Officer, relating to Age, Qualifications Community (Integrated) , Latest Creamy Layer exemption certificate in case of B.Cs as per Memo No.3009/BCW/OP/2009, Government of Telangana, Backward Classes Welfare (OP) Department, Dt:18/12/2015 (prescribed format hosted on Commission’s website), Certificates relating to claim of age relaxation, Study (from 4th class to 10th class), Agency area certificates (For ST candidates only) basic information data (Check List(1set), attestation forms (2 sets) and if any, at the time of verification of documents, failing which, they will not be admitted in subsequent process of selection. In terms of the notification, the candidates should possess the requisite qualifications as on date of notification i.e. 15-08-2017. 4. As per the Notification, “The post of F.B.O is 100% reserved in Scheduled/Agency areas for local ST’s only”. In this regard the ST Candidates in Agency areas should produce local area certificate issued by the concerned Tahsildar/ Mandal Revenue Officer as a criteria for admitting local candidature. 5. The Schedule for Physical Test and Events starts on 02/07/2018 onwards at concerned Local Dist., of the provisionally admitted candidates. 8. The day-wise schedule for Physical test & Events will be announced shortly on the Commission’s web site.